Permatech Permanent Makeup has been in business for over 15 years. They not only preform the latest techniques, they offer certified permanent makeup training. 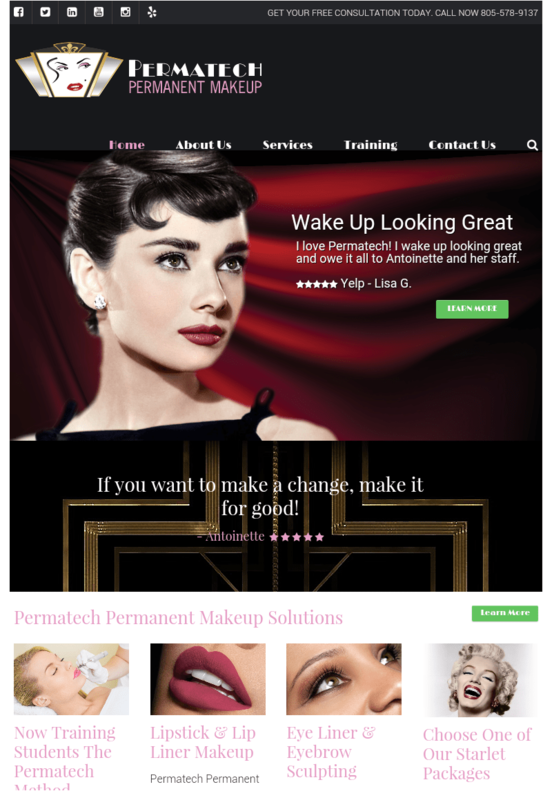 Permatech makeup is a permanent makeup application and training center. Permatech's website was not mobile-friendly, unorganized and difficult to navigate. Visitors on the site did not end up calling or inquiring about their services. They wanted to attract more new business and new students for their training classes. While traffic to their site could be improved Permatech did have visitors to their site. We focused on making the site mobile-friendly by designing it with a responsive WordPress design. Responsive sites automatically adjust to any screen size without redirecting the searcher to a separate site. We also reorganized the site by making sections and menu drop down options to clean up the header. Also added were multiple calls to action to direct visitors to call or make a submission to get a free consultation. Permatech is now attracting phone calls and email submissions from new clients and students wanting to learn the latest techniques. The calls to action and ease of finding their phone number on every page has increased contact by over 450%.